So far at the time of writing this post on 6th of August 2012, Australia has collected well below her usual chest of gold medals in the 2012 London Olympics. I like to have a quick glance at the medal tally every morning to see how countries are performing. In truth, I am happy for Kazakhstan and other under-dog countries that are snatching up a few glittering golds in this Olympics. Special mention goes to North Korea and even Georgia for getting at least one gold. But how is Australia doing compared to their past efforts in previous Olympics. Here are two graphs. Please note 2012 is not over yet, so Australian may still shine. EDIT 2: It’s all happening now. Two days after my post on the 8th of August aussies managed to climb to a total of 4 gold. 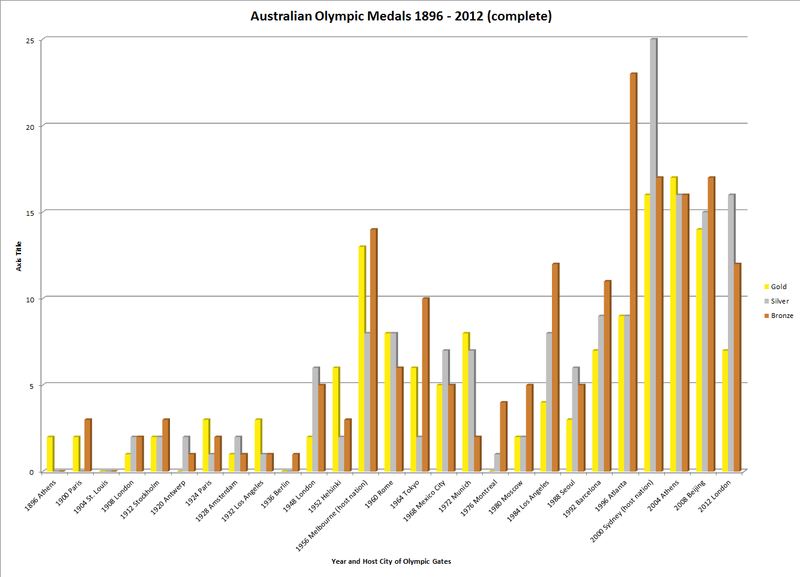 EDIT Final: Okies I came back after the Olympic games have ended and created a new chart with the medals. See below.